Indian Air Force announced the Indian Air Force Group X Y Airmen Recruitment 2019 notification for 01/2020 batch. As per this IAF Recruitment notice released on 3rd Dec 2018, Airmen vacancies can be filled by conducting an exam. The careerindianairforce.cdac.in online application of IAF jobs will be available on 2nd Jan 2019 www.airmenselection.cdac.in or www.careerindianairforce.cdac.in. Air Force Group X Y Airmen Exam Date update soon. Latest Update(03rd Jan 2018): Indian Air Force has commenced the IAF Group X Y Airmen Recruitment 2019 for the Group 01/2020 Batch. Applicants don’t miss the Air Force joining opportunity. 2nd Jan to 21st Jan 2019 are the application dates. 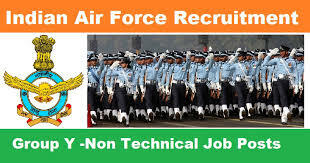 IAF Airmen Recruitment 2019: For the people who are looking for the Air Force Jobs Career, should definitely need this post to make a wonderful beginning of career by getting the job in the central government sector. Let’s start with the starting the process of this IAF recruitment of Airmen jobs and end with the application form link which directly opens the Airmen registration form. In Dec 2018, Indian Air Force career department made an employment notice which states the appointing of Airmen posts by the well capable and suitable candidates. But to reach that final stage of the IAF Group X Y Airmen Recruitment 2019 recruitment that is appointment letter, do you know what you have to do first? So the first thing is Fill the details in the registration form, pay the application fees and submit the Indian Air Force Group X Y Airmen Recruitment form in online as well as in offline on or before 21st Jan 2019. This Indian Air Force Group X Y Airmen Recruitment notice is available now from 3rd Dec 2018. That means for the selecting the Airmen training batch of 01/2020 Batch, now in Dec this IAF Group X Y notification application form will come into live on 2nd Jan 2019. Till that manage all the particulars that will be used in the application process on one hand and on the other hand practice for the initial round of qualification that is Screening test to the test the applicant’ s educational stuff. Follow recruitmentindia.in for more updates of Air Force jobs. IAF Airmen Online Application Form filling process will be done up to the end of the day of 21st Jan 2019. Before applying, check the brief description of this Indian Air Force Group X Y Airmen Recruitment 2019 and the organization. Indian Air Force is one the Indian Armed Forces. It gives many job chances for the interested contenders based on their educational qualifications like SSC, Inter or +2, Graduates etc. The recruitment from the side of the Indian Air Force is quite common every year. First, it selects candidates by conducting all the tests to check he is capable of doing the job or not. Then it will give the best training to them with respect to the job profile. It is a good choice by the candidates to join in the Air Force by the name of Airmen vacancies. Once you entered in those Air Force Job vacancies there are a lot of things to learn new. Never delay this type of chances so speed up your arrangements to fill the online application ofAirforcee careers. The complete qualifications for Indian Air Force Group X Y Airmen Recruitment 2019 notification as per the job wise. Group X (Technical): Intermediate Passed (Mathematics, Physics and English) with 50% Aggregate Marks & 50% Marks in English. Candidates, age must be as per the Indian Air Force Recruitment rules that are as follows. All the registration completed candidates have to pay Rs.250/- non-refundable application fees. Grab all the clarified data of this Indian Air Force X Y Airmen Notification @www.airmenselection.cdac.in. If you are through with the points that are mentioned in the official notification, and also you must be an eligible one then go for the checking of the application form link. Only +2 completed male candidates only accessible to fill the Air Force Airmen Registration form. Keep this point in mind and put concentration on getting this job by qualifying in all the recruitment tests. Upload Photo, Signature and required documents. Take the print out for further use. 28/06/1997 is my date of birth. I can do apply for IAF Group X & Y eligible sir ? Sir my D.O.B. is 18.04.1997. Can I apply for this? hy sir, i m girl..nd i m in 12 standard with arts stream , can i join the air force??? The candidates between 13 January 1998 and 02 January 2002 (both days inclusive) are eligible to apply. Sir,we have to fill the application in online and also have to send in offline? Or only online if enough? can I apply for this. Yes.. U can absuloutly eligible… But u can apply only y trade form…. Esme negative marking hogi ky exam m ?? Sir, is it enough to fill the application form in online or we need to apply both in online and also send the application through post. read the complete process of application in the official notification. please give me correct answer. see in the official notification. It clearly mentions the qualification required. Sir my dob is 03/01/98 can i fill this form? Sir now i`m in 12th standard.Can i apply for this application? Sir coz i m from assam and avi tk mainey post nhi kia hua hai…. Refer the official notification and site clearly. Read it in the official notification. I want to change my exam.center for XAndY group test. Pls tell me what is the process. The centers are very far for me. Sir iss Barr Jo online test hone wala ha Airman ka …. I m a girl..doing my 12th from arts stream so can i join the air force? 18/07/99 is my DOB, can apply for it. And what is tha important processor of IAF . I mean running or exam is important. sir mujhe 12 mai 63% hai or english mai 43 marks hai to airman ke liye apply kar sakta hu . mere papa ex servicemen hai. please reply sir.